Pleomorphic adenoma is a benign mixed salivary gland tumor and consists of a combination of epithelial and mesenchymal elements. The parotid and other major salivary glands are the common locations for it. Pleomorphic adenoma less frequently originates from minor salivary glands with a malignant potential in most of the cases. The present case is a pleomorphic adenoma of the minor salivary gland of soft palate in a 72-year-old male, and the tumor is large, well circumscribed, firm but still benign in nature and needs reporting. Salivary gland tumors are uncommon accounting for 2%–3% of head and neck neoplasms. Nearly 20%–40% of all salivary gland tumors occur in the minor salivary glands. Pleomorphic adenoma is the most common major (60%) and minor (70%) salivary gland neoplasms. Among all the minor salivary gland pleomorphic adenomas, palate is the most common intraoral site of origin followed by upper lip and buccal mucosa. The minor salivary gland origin was seen in 4%–5% of the cases and the involvement of the palate is a rare entity., We report a case of a pleomorphic adenoma arising in minor salivary glands of the soft palate in a 72-year-old male. A 72-year-old male presented with a round, well-circumscribed solid mass arising from soft palate for 7 months causing dysphagia. The patient was able to swallow semisolid and liquid diet only, due to large size of the tumor. On the local examination, a rounded mass of size approximately 5 cm × 5 cm was found over the soft palate extending to the hard palate which was firm in consistency and smooth surface without any ulcer or bleeding points [Figure 1]. The contrast-enhanced computed tomography (CT) scan showed a diffuse smooth mass over the soft palate extending to the hard palate without the involvement of any adjacent bony or soft-tissue structures, and neck nodes were not enlarged. All the routine hematological tests were within normal limit. Punch biopsy from the lesion showed features of benign pleomorphic adenoma of minor salivary gland. 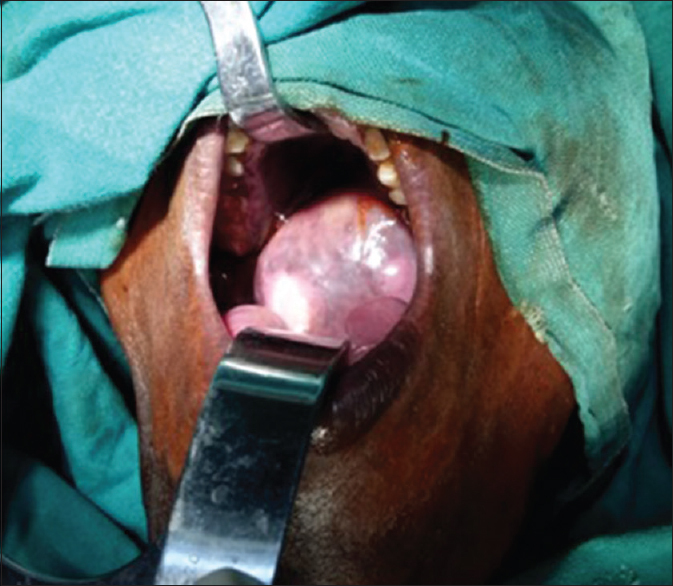 The patient was operated after nasal intubation and complete intraoral excision was possible with mass excised in toto [Figure 2]. The postoperative period was uneventful. Ryle's tube feeding was continued for 5 days. Afterward, he was able to take orally and recovered. 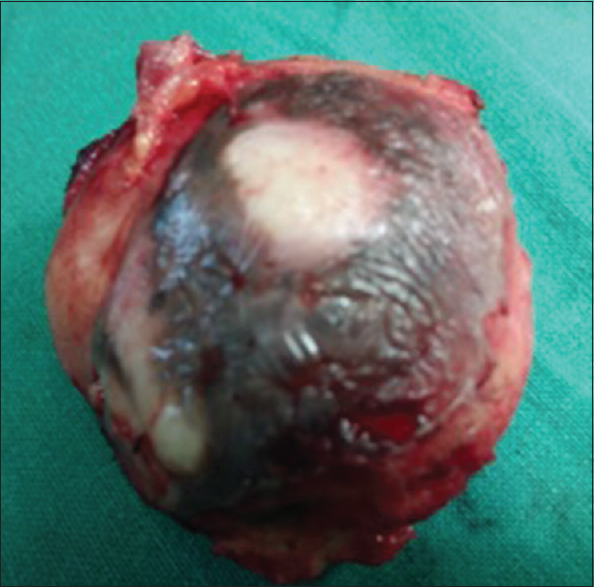 The postoperative gross specimen showed a solid mass of size approximately 4.5 cm × 4.5 cm with smooth surface [Figure 3], and microscopic examination revealed features of benign pleomorphic adenoma. Now, with a follow-up of 28 months, the patient is doing well without any recurrence or distant metastasis. The name pleomorphic adenoma is derived due to architectural pleomorphism on microscopic findings and is also known as “mixed tumor, salivary gland type.” It can present at any group, predominantly fourth to sixth decades of life with a slight female predominance. The exact etiology is unknown. However, the incidence increases from 15 to 20 years after exposure to radiation. An association of the tumor with simian virus 40 (SV 40) was found in few studies. An asymptomatic slowly progressing swelling is the common presentation of pleomorphic adenoma, and the lesion may become large if not treated. The majority of growths were mobile, firm, nodular, unilateral in location and measures about 2–6 cm in size at the time of presentation. Among the minor salivary gland pleomorphic adenoma, palate is the common location due to the highest concentration of salivary glands there followed by the lip, cheek, tongue, and floor of the mouth. The pleomorphic adenoma with palate location is typically present as smooth rubbery submucosal mass. Histologically, it is a biphasic tumor and is characterized by a mixture of polygonal epithelial and spindle-shaped myoepithelial elements in a variable background of stroma of mucoid, myxoid, cartilaginous, or hyaline. The spindle, clear, squamous, basaloid, cuboidal, plasmacytoid, oncocytic, mucous, and sebaceous are the distinct cell types for the epithelial component. Pleomorphic adenoma has three histologic subtypes: myxoid (80% stroma), cellular (myoepithelial predominant), and mixed (classic) type. Ultrasonography, CT, and magnetic resonance imaging (MRI) are the diagnostic imaging modalities for pleomorphic adenoma. CT and MRI provide information about the bony erosion, soft-tissue extension, and nerve involvement of the tumor. MRI accesses the tumor better for soft-tissue delineation, margin description of the tumor, and extension into the surrounding structures. Before treatment, fine-needle aspiration cytology or incisional biopsy should be performed for the pathological confirmation, and these procedures should follow diagnostic imaging to rule out a vascular lesion. Palatal abscesses, odontogenic and nonodontogenic cysts, fibroma, lipoma, neurofibroma, neurilemmoma, lymphoma, and other salivary gland tumors are the possible differential diagnoses for the pleomorphic adenoma of the palate. Due to the varied histopathological presentation, myoepithelioma, adenoid cystic carcinoma, mucoepidermoid carcinoma, and basal cell adenoma are the possible differential diagnoses. Histopathological confirmation is necessary to rule out benign and malignant tumors. In spite of benign nature, the pleomorphic adenoma may grow to large size and may undergo malignant transformation. The tumor can recur after resection, can invade normal adjacent tissue, and distant metastasis has been rarely reported after a long duration of follow-up. Pleomorphic adenomas of the minor glands have little propensity for recurrence. Inadequate surgical procedure is the main cause of failure, and pseudopodia, capsular penetration, and tumor rupture are the major surgical issues. The minor salivary gland tumors have a more malignant potential in comparison to major salivary gland tumors. The risk of malignant potential for pleomorphic adenoma is ranged from 1.9% to 23.3%. Wide local excision is the mainstay of treatment for pleomorphic adenoma and the removal of periosteum or bone required if they involved., Pleomorphic adenomas of the minor salivary glands on the palate sometimes lack encapsulations, resulting in tumor growth into normal host tissue, and therefore, a wide excision is necessary even if previous biopsies report benign nature. After complete excision of the palatal pleomorphic adenoma, the overlying mucosa and surgical wound closures occur with the advancement of adjacent mucosa as in our case. Reconstruction of the palate is an important issue from both a functional and esthetic point of view and will help to decide which approach is most suitable for the patient. 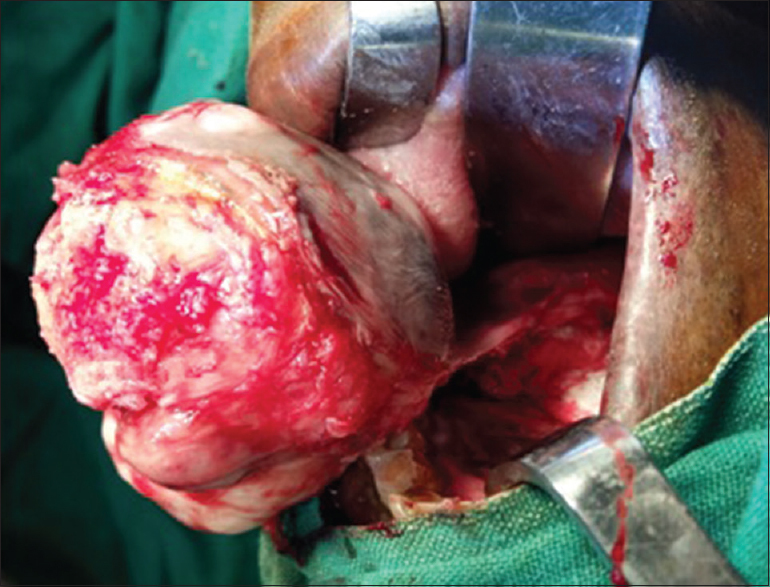 Complete excision was performed in the present case of pleomorphic adenoma of the minor salivary gland of the soft palate, and the patient is doing well since 28 months of follow-up without any recurrence or distant metastasis of the disease. Rahnama M, Orzędała-Koszel U, Czupkałło L, Lobacz M. Pleomorphic adenoma of the palate: A case report and review of the literature. Contemp Oncol (Pozn) 2013;17:103-6. Hmidi M, Aatifi H, Boukhari A, Zalagh M, Messary A. Pleomorphic adenoma of the soft palate: Major tumor in a minor gland. Pan Afr Med J 2015;22:281. Sreenivas DS. Pleomorphic adenoma of the palate: A case report. J Indian Dent Assoc 2011;5:557-8. Mubeen K, Vijayalakshmi KR, Pati AR, Girish BG, Chandravir S. Benign pleomorphic adenoma of minor salivary gland of palate. J Dent Oral Hyg 2011;3:82-8. Jain S, Hasan S, Vyas N, Shah N, Dalal S. Pleomorphic adenoma of the parotid gland: Report of a case with review of literature. Ethiop J Health Sci 2015;25:189-94. Sreenivas SD. Pleomorphic adenoma of the palate – A case report. JIDA 2011;5:4. Aggarwal A, Singh R, Sheikh S, Pallagatti S, Singla I. Pleomorphic adenoma of minor salivary gland: A case report. RSBO Rev Sul Bras Odontol 2012;9:97-101. Watts TL. Tumors of the hard palate and upper alveolar ridge. Grand Rounds Presentation. The University of Texas Medical Branch (UTMB), Department of Otolaryngology; 22 April, 2011.